(Bloomberg) -- A second day of frantic trading in Treasuries futures offered a stark reminder of the danger of betting against the world’s safest asset. A block trade of over 24,000 10-year Treasury futures, the equivalent of $2.1 billion of cash bonds changing hands, was unusually large for the time of day in early London hours. 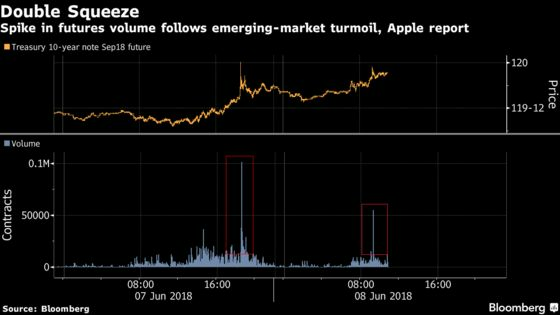 This mirrors the three minutes of chaotic moves seen Thursday where Treasuries suddenly surged as turmoil in emerging markets spooked global investors. Benchmark yields, which had been attempting to breach the key psychological level of 3 percent, have swiftly retreated. The moves on Friday were sparked by a drop in technology stocks that spurred risk-off global market sentiment after Nikkei reported that Apple Inc. told its supply chain to prepare for 20 percent fewer components for iPhones debuting in the latter half of this year. On Thursday traders pointed to Brazilian officials’ unsuccessful efforts to stem the free-fall in their currency as the trigger for the wave of Treasuries buying. Ten-year Treasury yields fell one basis points to 2.91 percent by 12:25 p.m. in London Friday, having fallen five basis points Thursday, while futures rose to the day’s highs after the block trade. German bunds surged to catch up, with 10-year yields dropping six basis points to 0.43 percent. The rush was magnified because investors were caught offside -- there had been a dramatic increase in short bets against U.S. government debt in the past week. The abruptness of Thursday’s move, which saw yields on benchmark 10-year notes plunging as much as nine basis points, was apparent in the futures market: From 1:33 p.m. New York time to 1:36 p.m. Thursday, more than 100,000 contracts on 10-year futures changed hands. To put that in context, that’s more than the 80,000 that traded over a similar span at the time of last Friday’s release of U.S. labor data. At the start of New York trading Thursday, traders were focusing more on the prospect that European Central Bank officials could use next week’s meeting to signal their timing for stepping back from bond buying. But the bout of market panic shoved that talk to the back burner. And there’s no lack of risk-laden events in the days ahead -- think the Group-of-Seven summit or the planned meeting between the U.S. and North Korean leaders -- to keep bond bears on their toes.